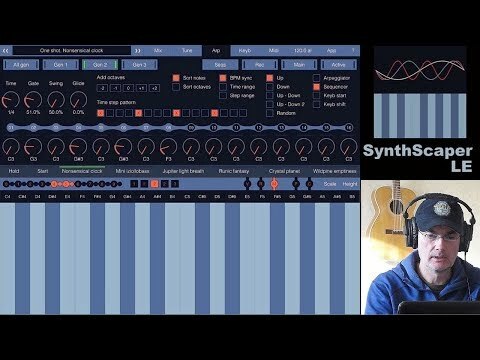 This is a new feature in the SynthScaper LE that lets you easily change the sound of presets and scenes. With this panel you can change parameters of each sound generator individually. Two main parameters which have noticeable effect on sound are Attack and Release. On the panel "Tune" you can set the offset of these parameters from the value that defined by preset or scene. The offset is performed for all ADSRs of all layers in such a way as not to break the base structure of tone. The parameter "Accent" affect only on ADSRs which assigned on the volume levels. When this offset is positive the values of "Decay" will be increase and "Sustain" decrease. When offset is negative the values of "Decay" will be decrease and "Sustain" increase. The parameter "Level adjust" change level of each layer. In case when for sound generator uses more that one layer. Changing this value you can amplify or attenuate volume level of each layer relatively others. Use this parameter neatly even a slightly change can have very noticeable affect on mix of layers. 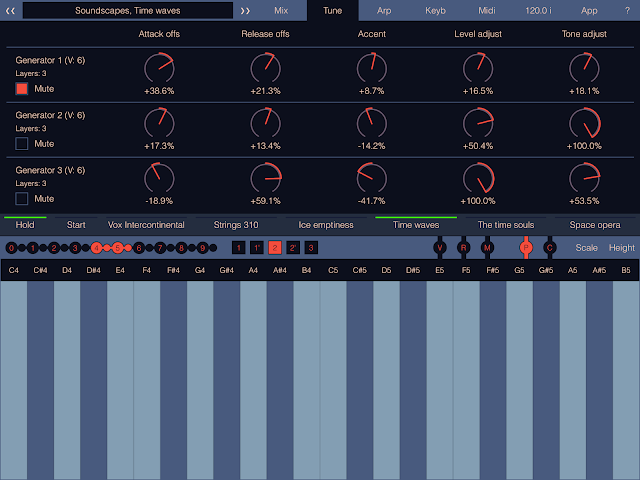 The parameter "Tone adjust" increase or decrease offset of base tone for each layer in cents. Usually tone of each layer a very slightly shifted relatively each other. It gives more bright and saturated sound. So this parameter will increase dissonance when it positive or decrease it when negative. With these parameters you can slightly change the sound of generators to make it smoother or sharper. Or make sound completely different from original. The main advantage of this panel is that you can easy restore original sound of generator just reset all parameters to zero. Even when you save this scene and return to it later. Also you can assign these parameters to any MIDI keyboard or controller and operate them in real time.